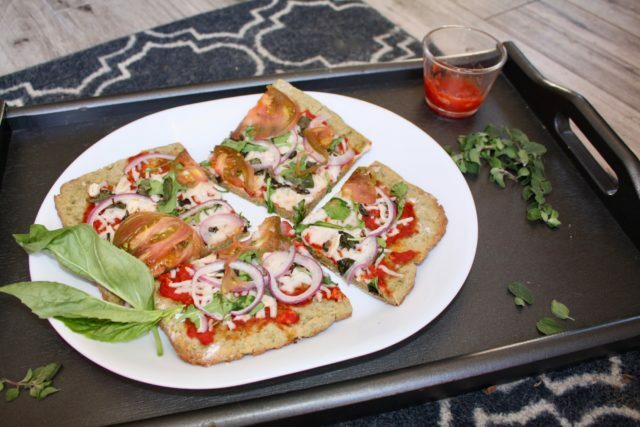 Homemade pizza is a great dinner idea to share with your family, as an appetizer at a party or even an afternoon snack with your friends. Using plant-based, vegan, and gluten free ingredients, this is one home-style recipe you can confidently share to appease all diets. In a small bowl, combine 1 packet of dry active yeast (7g) with ¼ cup of warm water. Make sure the water is warm and not too hot or it will kill the yeast! Let set for 5 minutes to activate and sprinkle in 1/2 tsp of the sugar a few minutes in. Microwave or thaw completely 2 Sunshine Burger Garden Herb Patties and mash until a soft, separated crumble. Makes roughly 1 cup. 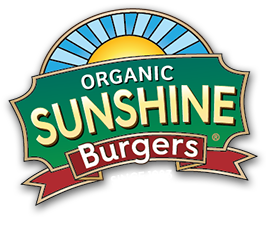 In a separate bowl, combine gluten free flour blend, Sunshine Burger crumble salt, baking powder and remaining 2 Tbsp of sugar. Whisk until combined. Make a crater in the dry mixture (see photo) and add the yeast mixture to the center of the crater. Add the olive oil and additional 1/2 cup of warm water to the bowl. Then stir all of the ingredients together until well combined, making a pasty dough. 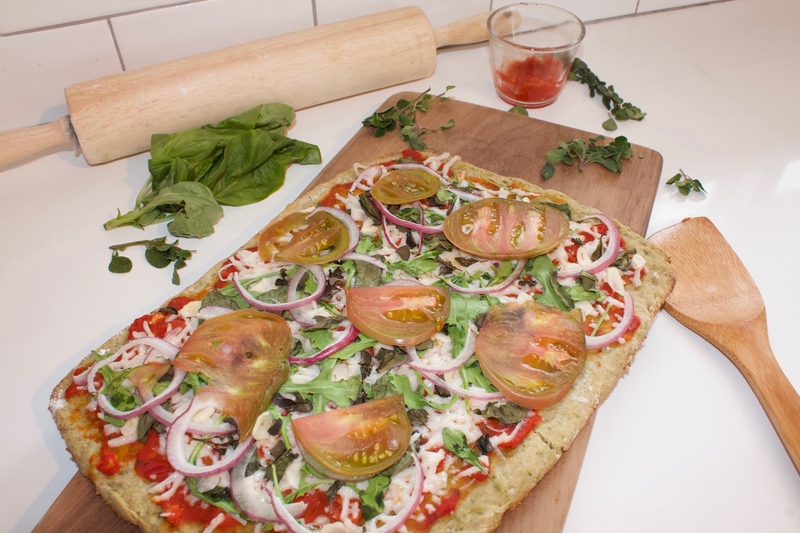 Lightly coat a baking sheet or pizza stone with non-stick spray or oil. Using your hands or a spatula, flatten the dough out to make a rectangle. Use a pin roller to smooth the dough out evenly and to make a thin crust. Put the pizza in the oven to pre-bake for roughly 25-30 minutes, or until it begins to crisp along the edges. Thinly slice red onion, heirloom tomatoes, and garlic, chop up basil and oregano and set aside. Remove from the oven and spread Lucini Roasted Garlic Marinara evenly across the dough, making sure there is not too much sauce or you’re dough will get soggy. Top with Daiya Mozzarella Style Shreds, fresh basil, oregano, sliced garlic and arugula. Pop back into the oven for another 15 minutes, or until the crust’s edge looks golden brown and the toppings are melted.